We’ve got a new camera contest thanks to our friends over at Lensbaby. You can win a new Fujifilm X-T10 and a great Lensbaby Velvet 56 to put on it. This is the perfect combination for street photography or travel. All general Photofocus contest rules apply. Photofocus Contest Page. You must enter using the Rafflecopter widget. The prize will be announced on July 1, 2016 by @Photofocus via Twitter and on Photofocus.com. US residents responsible for any taxes (if any) incurred as winner. If you live outside the US you are responsible for any taxes, custom duties and shipping in the event you win. As always, if you are not a fan of these contests, please don’t participate. For the tens of thousands of you who do enjoy the contests, well continue to try to find new contests and new prizes that will make it fun and interesting to be a part of the Photofocus family. Thanks for your support. *We reserve the right to substitute a different camera of equal or higher value in the event the manufacturer cannot meet demand or to offer a cash equivalent paid in U.S. dollars to any winner. Go for that beautiful fuji!!! X-T10 would make a great backup to my X-T1…! And who doesn’t want a lensbaby to play with. This would be so rad to win! I would gift it to my father for his birthday! I have been eye-ing the Fuji X-T10 for quite a while and would be an awesome surprise if I win it and receive it for my birthday (July 14th) 🙂 And I will challenge myself to take an awesome photo everyday for a whole year (and link to your website)! The Fuji X-T10 has had such wonderful reviews that I would really love to own it as it is highly customizable, small and lightweight making it easy for travel and just looks good overall! Plus I love the fact that the Lensbaby Velvet 56 produces soft and velvety effects! It´s a classic and great camera. Super prize for contest. My niece just bought Fuji X-A2 and I fall in love with a sweet images from Fujifilm. I never try Lensbaby yet, would be excited to play with. I would love a new camera I have an extreme interest in photography just need a better camera to work at it, and this one would be awesome. I don’t have a camera.. this would be an amazing one to win! thank you for the chance! I’d love to join the Fuji family! 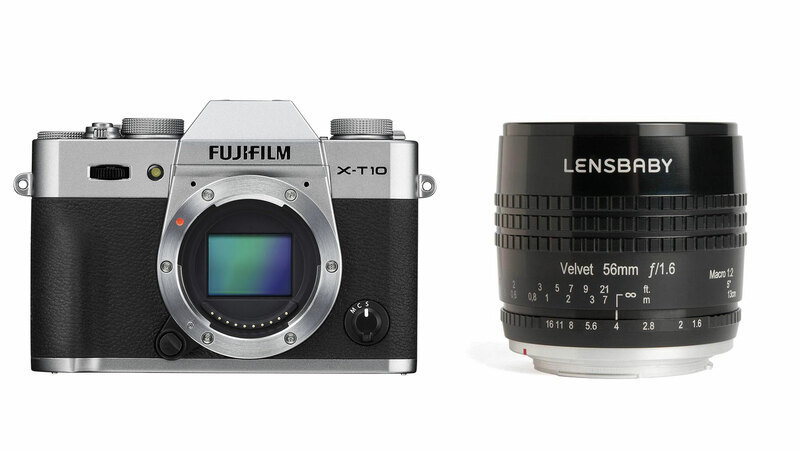 I would love the compact X-T10 and the Lensbaby would be a sweet sweet lens to go with it!!! This would be a great way to strike out from my ageing DSLR setup. I’ve been eyeing mirrorless and Fuji for a quite a while. And would be fascinating to explore the Lensbaby route too! I have never owned a fixed aperture lens, this would be my first one! This is a fixed focal length lens… but the aperture can be changed and is very creative. Will have to win a mirrorless to try it! It would be awesome to gift him this, he would LOVE it! Cool contest! Good luck everyone! I’d love to take some dreamy pictures with this kit. I would love to win the body and lens! FYI … The rafflecopter widget for this contest is linking to the Sony Alpha A7 / Spiderholster blog post for the “leave a comment” part. The camera looks awesome but I really want that lensbaby! That lens look so good! Awesome contest; great prize.. but mostly great content on the whole site. I have never tried a fuji camera, and the lensbaby lens looks sweet! Go for that amazing Fuji camera! Oh good god I would love to have a professional camera! Fuji well know for there excellent Cameras. Would love to own one! What a wonderful prize! I’m excited for the chance to win it! Gotta love Fuji Colors !